Ageless Aesthetics and Salt Lounge is a haven of peace and tranquility, where innovation and expertise meet to create age-defying vitality and timeless beauty. Offering a wide range of services at competitive prices, including a dry air salt therapy chamber, Ageless Aesthetics and Salt Lounge brings a world-class spa experience to Indianapolis. Ageless Aesthetics and Salt Lounge is owned by registered nurses (RNs), who expertly transform aging skin with cutting-edge medical grade injections, such as Belotero Balance® and Xeomin®. Skilled aestheticians repair and perfect your skin with an array of treatments, including facials and peels, laser hair removal, intense pulsed light therapy, and Venus Freeze™ laser skin tightening and body contouring. Spending time in the salt lounge at Ageless Aesthetics and Salt Lounge is both relaxing and reenergizing. The walls of the lounge are lined with minerals from Dead Sea salt crystals. The result is air that cleanses the lungs and detoxifies the skin. Dry air salt therapy promotes health and a youthful glow from the inside out. As the Indiana SkinCeuticals® flagship store, a full line of science-backed skin care products is available at Ageless Aesthetics and Salt Lounge. Designed to protect, prevent, and correct, Skinceuticals nourish the skin while sustaining optimal anti-aging results. The friendly staff at Ageless Aesthetics and Salt Lounge takes pride in providing an ideal customer experience. Clients leave the spa feeling pampered and replenished, their skin revitalized and their confidence reborn. 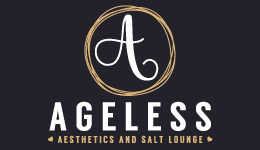 Ageless Aesthetics and Salt Lounge helps people look and feel beautiful at any age. Click Below to Download Our App! Come experience the healing benefits of salt therapy. The Venus Freeze Plus® uses radiofrequency energy to ramp up production of collagen and elastin, helping your skin look and feel firmer and smoother. Learn how the system works — and how it can help you. Natural salt therapy can provide a wide range of health benefits, improving respiratory ailments, skin problems and more — and all without drugs. Find out if it can help you improve your health and wellness. Thin lips can make you look old, tired and worn out. With Juvederm injections, you can restore natural lip fullness for a more attractive smile and better self-confidence. Better still: Treatment takes less than half an hour. "After receiving laser hair treatments elsewhere, I found Ageless Aesthetics and was immediately impressed. The staff is professional and knowledgable." "After doing a lot of research, I made an appointment at Ageless Aesthetics and I'm so glad I did! One session has shown positive and visible results!" "The staff is very professional and dedicated to getting you the results you want! The prices are affordable with no cuts on quality of service or products."